Tech21 Evo Mesh case is part of the company’s extensive iPhone 6 lineup. The protective cover is made for users who like to keep their smartphone intact without breaking the bank for an all-out rugged solution. Based in London, Tech21 creates mobile accessories with a science-first approach. The company has been in the business since 2005 and is the first to use shock-absorbing polymers in its products. The Evo Mesh case for iPhone 6 features a frame made of FlexShock. The latter is hybrid impact protection material, which absorbs and repels shock from the smartphone when dropped. Advanced TPU shell with check patter on the back completes the setup. The Evo Mesh case looks casually handsome in the flesh thanks to the contrasting FlexShock frame and TPU shell. The latter is available in a variety of colors, which range from dark gray like the unit I tested, though clear shell that showcases the color of your iPhone, all the way to more eye-grabbing shades like blue and purple. The visual downside of the Evo Mesh case is that, despite all the clever tech inside it, it doesn’t look too different from the cheap TPU covers out there. The build material won’t wow you with tactility either. As far as keeping your iPhone 6 intact goes, the Tech21 Evo Mesh is surely up to the task. The cover handles casual drops without breaking a sweat – it truly allows you to act sloppy with your device without worrying much about the consequences. 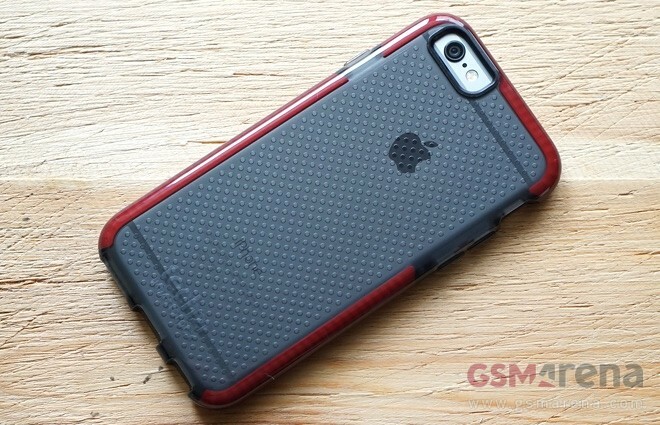 Ergonomics of the Evo Mesh case are overall good – all ports of the iPhone are left uncovered and easy to access. The device’s power/lock key and volume buttons are covered, but offer good feedback. At 30 grams of weight, the case is not heavy considering the protection it offers. However, at 75mm of width, it makes the iPhone 6 (67mm wide) considerably wider and more difficult to handle with one hand. The Tech21 Evo Mesh case is a solid offering for users who are looking for a tough case which doesn’t go over board with rugged looks. You will likely find more elegant offerings for your money, though they surely won’t keep your iPhone 6 in one piece the way the Evo Mesh case will. The Evo Mesh cover is priced at $34.99. You can find it in Tech21’s official online store or at an Apple Store near you.